(by Brad Durrell) More than 300 people — including young people — have volunteered with Food 2 Kids during the current school year. Some have given more than 200 hours while others volunteer once through an organization or business. Many church members are regular volunteers. "It empowers them," Grant said. "There are so many problems in the world, and this is one small thing you can do to make a difference in your community." 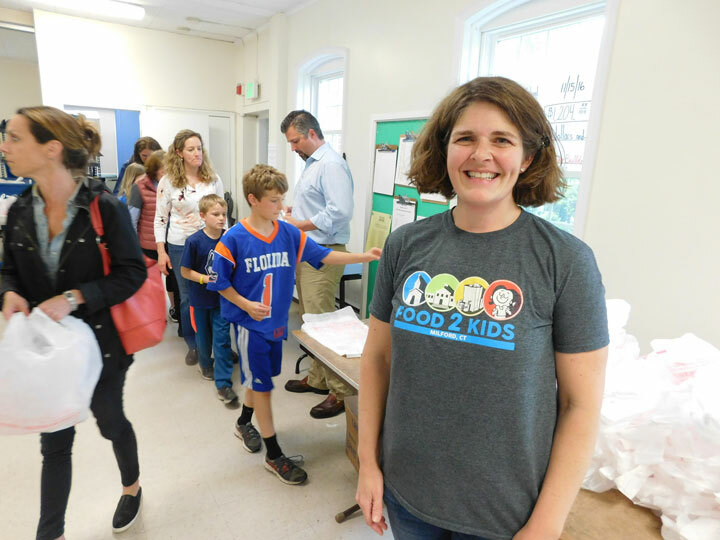 Tracy Hoppock of Milford, a UCC member, has volunteered to prepare food bags on Thursday mornings since the spring as a way to give back to the community. "I didn't realize how much need there was in Milford," she said. Retiree Chuck Huda of Milford wanted to get more involved in the community so he began volunteering. He helps unload delivered items and set up packing tables. "It's good to give something back — and to see all the kids involved," Huda said. "It's hard to describe the feeling. It keeps you going, really."